The force of moving land can be an incredibly powerful thing. Land, at its most rural, when tumbling down a mountain, has the ability to destroy anything in its path. 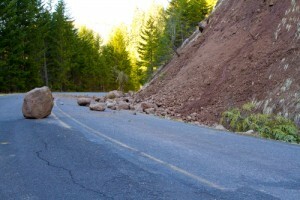 When landslides strike, it may seem impossible to combat, but 911 Restoration wants to let you know that there are ways to prepare for such an event. When you find yourself faced with the possibility of an onslaught of mud coming straight toward your home, there are certain steps you can take to minimize the damage, or even avoid the whole thing all together. It’s important to know that it can be a risk to build or buy a home that is based close to the edge of a mountain or near a steep slope. If you are considering it, then you need to make sure the property ground is assessed in order to make sure that landslides are not a risk. Hire a professional and get an accurate, thorough report. It is worth it for the safety of your home and your family. If you do end up living in an area where mudslides are common, then make sure you and everyone in the household are aware of the emergency evacuation plan that your city has set in place. This will give you all a clear-cut strategy about what to do when a landslide is eminent. There are also ways you can minimize the damage that a landslide causes, such as installing flexible pipe fittings that will prevent both gas and water leaks during a disaster. You can plant foliage on slopes that have exposed dirt, which should help prevent mudslides, as well as installing retaining walls to keep soil at bay. If you find yourself faced directly with an active landslide, you should make sure to stay awake and alert. Never go to sleep during a landslide, even if you feel your home is safe. This is the time that most debris-flow fatalities occur. It is important to be hyper-aware of your surroundings, listening for tree cracks, moving boulders and heavy rain fall. If you live near flowing water, make sure you are mindful of an increase in water movement. It may be necessary to drive during a landslide. If that is the case, drive slowly and calmly. Do not cross flooded streams and watch the road for obstructions, such as broken pavement, large rocks, and mud. Once you have cleared the area, do not return until officials have announced it is safe to go back. 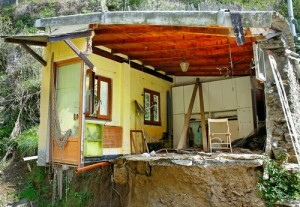 Floods usually come after a landslide, so it is better to keep away for a while until all potential danger has passed.